​Free-Mart’s Nature’s Nutrients is one of the most nutrient-dense food sources on the planet. Free-Mart’s Nature’s Nutrients is one of the most nutrient-dense food sources on the planet. It is a whole food that is full of complex nutrients which work together synergistically to restore optimal health. It is the result of a specialized processing of rice concentrates and extracts. It consists of perfect chains of essential fatty acids, trace minerals, amino acids, PhytoNutrients, glyconutrients, and over 90 powerful antioxidants including tocotrienols, which have been found to be 6,000 times more effective than vitamin E. Because they are in perfect ratio with each other, they are absorbed into the body – not as bits and pieces but as whole organic structures. These building blocks of nutrition help repair organs (like the heart and liver) at the cellular level. These nutrients slow aging and aid the body to repair, rebuild, and restore itself. Its powerful glyconutrients help all other nutrients that you ingest to work better. 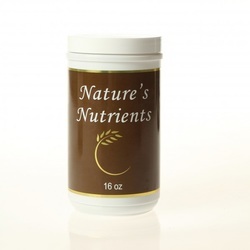 Nature’s Nutrients is yeast-free, starch free and sugar-free. And because it is a whole-food instead of a drug or supplement, there is no danger of overdosing on antioxidants, or its other substances. Free radicals attack the outer walls of your cells, leaving gaping holes that deplete oxygen and cause leakage of cellular fluids, all of which damages the DNA within. This damage can lead to cell dysfunction, cell death, or the transformation of the injured cells into cancerous cells. It has been estimated that each of your cells receives as many as 10,000 oxidative hits per day. This demonstrates why the consumption of potent antioxidants is crucial for our health. Antioxidants protect your body from free radicals, however, antioxidants do not work effectively by themselves. They need to be part of an antioxidant system. The principal antioxidant compounds present in Nature’s Nutrients are tocotrienols, tocopherols, and oryzanols. The first two compounds include eight different chemical forms that together are commonly referred to as vitamin E. The least active tocotrienol antioxidant is 40 to 60 times more potent than vitamin E. And the most active tocotrienol found in Nature’s Nutrients is up to 1,000 times more powerful than vitamin E’s alpha tocopherol. Furthermore, some of the compounds in our stabilized rice polishings have over 10-times greater antioxidant activity than pycnogenol. Nature’s Nutrients contain the universal antioxidant lipoic acid. Lipoic acid is not only the ideal anti-aging antioxidant but also an essential coenzyme factor in the production of energy. Lipoic acid can go anywhere in the body because of its unique characteristic of being both water-and fat-soluble. Lipoic acid is especially good for diabetics since it stabilizes blood sugar, reduces energy swings and reduces sugar cravings. Glutathione is another antioxidant found in Nature’s Nutrients. Glutathione has been named the “master antioxidant” because without it, other antioxidants have little value in reducing oxidative stress. Glutathione is often a missing factor when battling weight gain, hyperactivity, alcohol, sugar, caffeine addiction, allergies, arthritis, cataracts and lung, skin, prostate and bladder cancers. Increasing Glutathione levels can be of major benefit when fighting any battle with disease. Most individuals over the age 65 are deficient in glutathione which makes them susceptible to all kinds of disease, especially cancer. Glutathione is also a powerful detoxifier and without cleaning your body terrain, all other remedies will prove less effective. Nature’s Nutrients contains the anti-aging antioxidant mineral selenium. Working together with vitamin E, selenium strengthens your immune system, thyroid functions and it works to keep your heart, liver and pancreas healthy. Ane one of the major benefits of selenium is its ability to fight cancer. Another nutrient found in Nature’s Nutrients is gamma-oryzanol which can be effective in reducing stress and lowering elevated levels of cholesterol and triglycerides. Several studies show how gamma-oryzanol has beneficial effects on menopausal problems, hormone imbalances, head and neck injuries and other autonomic nervous system problems. The gamma-oryzanol and ferulic acid combination found naturally in Nature’s Nutrients stabilized rice concentrates is a favorite of athletes. Not only has it been shown to increase muscle mass and muscle strength, but also to improve body composition, decrease body fat, while enhancing recovery times and reducing muscle soreness. Russian athletes found that vitamin B-15 (pangamic acid) increased oxygen to the cells, thus increasing endurance. Nature’s Nutrients is an excellent source of all the B Vitamins including B-15. B Vitamins help protect neurons against damage in nerve cells and omega-3 fatty acids found in Nature’s Nutrients keep nerve cells firing at optimal speed. If you are not eating nutrient-dense whole food then you are not protecting or feeding your cells properly. Starving unprotected cells equals discomfort, disease, premature aging and death. Nature’s Nutrients is a cell-ready food and the most nutrient-dense food source known. It contains one of the largest arrays of antioxidants, plus and army of other nutrients including phytochemicals, vitamins, minerals, essential amino acids, and the essential fatty acids. The essential fatty acids (oils of life) in Nature’s Nutrients create the mortar that holds your body together, protects your cells, improves hormone production and balance (insufficiency can cause P.M.S., menopausal problems, low testosterone, and infertility), reduces brain fog, pain, UV damage to the skin, and wrinkles. These essential fatty acids also protect against pesticides and other toxins. Nature’s Nutrients may offer protection from premature aging, heart disease, osteoporosis, cancer, stroke, diabetes, arthritis, Alzheimer’s disease and certain eye diseases such as macular degeneration and cataracts. It provides the nutritional therapy and protection that your diet often does not have. This benefit is critical for individuals who are suffering from fatigue and low energy and often turn to coffee, colas, or other stimulants for help. Nature’s Nutrients provide natural energy which can stop the need for stimulants of any kind. Dramatic results have been seen with diabetics and older people. Elderly people benefit greatly from these nutrients. In addition to the stabilized rice concentrates, we have added the seeds and skin of Muscadine Grapes, which are perhaps the best source of Resveratrol. Researchers believe that evidence is sufficiently strong enough to conclude that a single dose of resveratrol is able to induce beneficial physiologic responses which are known to be anti-aging. Resveratrol also contains other powerful antioxidants which protect and restore immune function, resulting in a broad spectrum protection from oxidative stress throughout the body. These two natural food combinations assist in giving your body what it needs “naturally” and science still can’t duplicate or replace what God has given to us naturally. “When you implement an optimal nutrition program, don’t expect rapid results because the body needs time to grow new improved cells,” says Dr. Michael Colgan. After many years in sports nutrition, the shortest program that he gives to any athlete is six months. You should consider the same approach. Give your body good nutrition for the next 3-6 months and you may be pleasantly surprsed at the results as newer and healthier cells gradually replace the old and worn out ones. It may take a year to replace all all of your bones, but even in as little as six months you can potentially see some amazing results. 1 ½ cups sweetener (honey, maple syrup); 3 cups natural peanut butter or other nut butter; 1½ cups water. Add 3 Teaspoons Vanilla, Maple, Lemon, Nutmeg, Cinnamon, Orange, or flavoring of your choice. These are your bars so add things you like to eat and enjoy. Pour over the dry mixture and shape into balls or bars, then wrap and put into your fridge or freezer. I will never be without this product the rest of my life! I heard Bevonne say it first, but I agree completely that this amazing product replaces the $200.00 worth of products that I had been buying almost every month. But the best part of all is that for $39.00, its now in a form that certainly feels like it is much more bio-available than anything I’ve ever tried before. I can really feel the difference within about 20 minutes of taking it, and that is definitely more than I can say for all of those bottles of vitamins, minerals, amino acids, etc. that were cluttering up my shelves. They were better than nothing, but the ritual of all of that pill swallowing was getting tiresome to say the least! lol And oddly enough, I had just said to myself (and to God) WHY can’t there be just one pill or even two or three, or some way to get all of this nutrition into a form that is quick and easy??!!! And so when I heard John talking about this fabulous new product only a few days later, I had to smile and say thank you God, and you too John, David and Bevonne! !